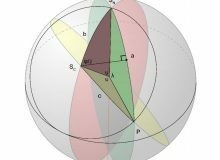 200 years ago, Napier and others wrote about the Law of Sines for spherical angles, expanding on work begun by the Arabs. 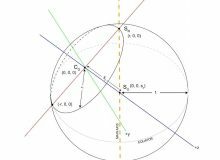 Approximately 150 years ago, a treatise on this branch of mathematics (Todhunter’s textbook “Spherical Trigonometry”) was published. From then until now, this was considered to be the complete story regarding spherical trigonometry. Nothing new has been revealed in this area of mathematics since those times. 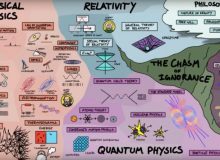 When relativity became a popular study about 100 years ago, the existing (believed to be complete) understanding of spherical trigonometry wasn’t powerful enough to solve many of the new mathematical problems that were popping up. So, they figured out a work-around where they could analyze the spherical surface while ignoring dihedral angles as being inconsequential, since another way had been found to solve these problems which yielded identical results. 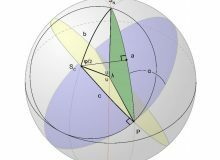 Not knowing much about this history, we came upon a need to solve a set of problems that required an extended version of spherical trigonometry. Because we didn’t know any better, our approach focused heavily on looking at the dihedral angle rather than the surface curvature, which is the standard approach. More specifically, we solved for the dihedral angles corresponding to the slope of tangents to a small circle oriented on the sphere surface. What we found by doing it this way is that we get a new set of relationships that exist on the spherical surface. Oddly, we don’t believe these relationships exist in any of the conventional mathematical methods. These new relationships don’t seem to make any difference at all when you try to look only at how they impact our understanding of Euclidean 3-space. But, when we look at spacetime with this same set of relationships in mind, things appear to take on a whole new meaning. The reason for this difference appears to be due to the difference in how these relationships are defined. All of our conventional geometric relationships can be shoehorned into a manifold as a mathematical construct. The new relationship doesn’t appear to fall into this category. Conventionally, relativistic transformations deal with manifolds where it is (probably incorrectly) assumed that all adjacent points are mathematically in Euclidean space. By this we mean that since the math that is utilized in order to connect adjacent points is plane geometry, it doesn’t capture all of the relationships that exist in Euclidean space. The foundation for plane geometry is two directions that are perpendicular to one another. Sure, there can be many of these 2-dimensional relationships stacked up to create 3-or-more-dimensional manifolds, but the math still breaks down to plane geometry, where adjacent points always relate to one another in a plane, even when there are multiple planes. The new relationship deals with the adjacent points that lie in three directions that are orthogonal to one another. It’s fundamentally different than existing relationships. Because of this, adjacent points that are related to one another in three directions, synchronously, must combine differently with time in order to create a mathematical model of spacetime. This difference is forced onto the model by mathematical necessity.